If you plan on making rings, you need to get a ring mandrel. When you go shopping for your first ring mandrel you’re going to have to decide between steel, aluminum or hard wood. 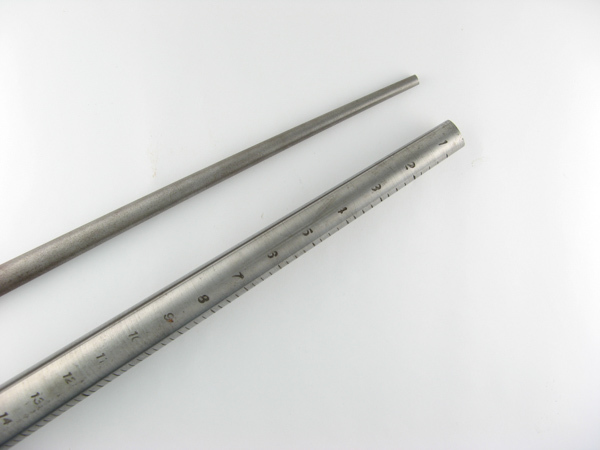 Some steel and aluminum mandrels come with finger gauge sets. They are precision machined and calibrated to one another. The finger gauge sets are a must have item when you are making rings. Most customers don’t know their ring size. So, before making a custom ring for anyone always size the finger that the ring will be worn on. A lot of wire workers go with the hardwood ring stick. It’s lightweight, affordable and the size markings are grooved around the full circumference of the mandrel. I prefer the smooth steel mandrel with partially grooved size markings. When I make wire rings sometimes I need to stretch the ring to make it slightly larger. I do this by tapping it farther onto the ring mandrel with a rawhide hammer. If you have a fully grooved mark around the mandrel sometimes the ring gets stuck. Without the grooves it makes it easier to slide the ring off of the mandrel. Ring mandrels come in different shapes too. You can get forming mandrels that come in many shapes like; rectangle, square octagon, oval and round. I got the cut-corner rectangle because I wanted to make a border wrap pendant with an emerald...I’m still experimenting. You can also buy bezel mandrels which are basically forming mandrels of various shapes like; teardrop, triangle, rectangle, square, oval, round, and miniature round. All of these forming mandrels are tapered. I have a round mandrel that I call the mini mandrel. It starts at 4mm and graduates to 12mm. It’s handy for forming pendant bails of different sizes. If a customer needs a pendant bail to accommodate a large necklace it’s easy to measure on the mini mandrel with a vernier caliper and make the correct size the first time. Ring mandrels and forming mandrels can be used for lots of projects and not just for making rings. You can use them for making earrings, pendants, bails, and clasps. And for shaping rings that aren’t round, straightening crooked wires, enlarging rings and earrings, and gauging pendant bails and clasps. So run out and get yourself a ring mandrel and start making rings with our ring tutorials.